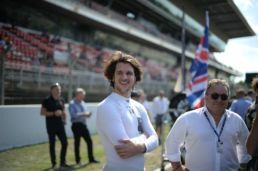 A thrilling final race in Barcelona for the Blancpain GT Series Endurance Cup, full of unpredictable events until the checkered flag. On the eve, the fight for the Silver Cup title still saw three contenders: Barwell Motorsport #78 Lamborghini Huracan GT3, Black Falcon #6 Mercedes AMG GT3 and Emil Frey #54 Jaguar. Already in qualify, Michele Beretta brought his Lamborghini in first position, just a few tenths from the overall pole position, getting the best qualification of the season; unfortunately, however, a series of breaks due to accidents prevented his team-mates Martin Kodric and Sandy Mitchell to set equally significant times in the two following sessions, forcing the british team to recede in sixteenth place (4th of Silver Class). At the start, it was Beretta as always to start the race which, after a good first stint always attached to the first and with a very incisive pace, left the car to Sandy Mitchell in fourteenth position (second of Silver Cup). 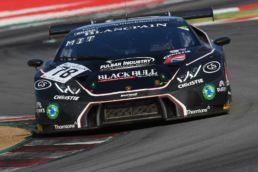 Just few laps later, the british driver was pushed off the track, damaging the rear wing that forced the Huracan GT3 to an extra pit-stop loosing two positions. Nothing to do even for Martin Kodric who, with a car no longer in perfect condition, could only keep the position until the finish line, where to win was the Jaguar of the team Emil Frey Racing, which also conquer the Silver Cup title.